The media is threatening politicians’ “capacity to take the right decisions for the country”. Modern media means that reports are “driven by impact”. The relationship between the media and politics has been “damaged”. Blair’s back in cuckoo land. His first statement assumes that politicians always know what the right decisions are. The second one is a joke when you consider how the Alastair Campbells of this world have timed announcements for maximum impact. And finally, politicians are equally to blame for the damaged relationship. Contrary to popular belief, there wasn’t a snap change overnight in May 1997. The Thatcher era expanded the divide between reporters and the reported. But 24-hour news did make a difference. It led to constant analysis of decisions, so that the cooling-down period offered by the newspapers’ life-cycle was destroyed. The new diversity of media sources also made a difference. There is now an outlet for every viewpoint, however extreme or forthright. But the preferential treatment and spinning dealt out by New Labour put unbearable pressure on the always difficult relationship between journalists and politicians. It’s right that journalism should ask challenging questions of the powerful. In its perfect form, journalism is the voice of the people, although in practice it only sometimes achieves that aim. But Tony Blair and co took these challenges as a personal slight. It is the way in which modern politicians react to the modern media which has damaged the relationship between the two. My favourite quote was a complaint that: “There will often be as much interpretation of what a politician is saying, as there is coverage of them actually saying it.” Because of course, what Tony Blair says is the gospel. That Catholic deacon story suddenly seems less far-fetched. Tony Blair’s got twenty-one days until he moves home and finds himself relatively unemployed. The removal vans have already arrived. But you have to wonder why it’s only the furniture that’s moving out today, and not the owners too. Blair was supposed to go on a six-week legacy tour, saving the world and reminding us how much he’s achieved since 1997. So what’s he managed to do? So this week’s G8 meeting had better be good. Nothing short of a deal with the United States on climate change would be enough to have made this six-week holiday worthwhile. ITV have scheduled an exciting episode of Emmerdale Family Album this Thursday at 7.30pm. If they show it, I’ll eat my hat. Is Blair about to rewrite his foreign policy legacy? Tony Blair is pushing the United Nations to declare a no-fly zone over Darfur, enforced if necessary by the bombing of Sudanese military airfields used for raids on the province, the Guardian has learned. The controversial initiative comes as a classified report by a UN panel of experts alleges Sudan has violated UN resolutions by moving arms into Darfur, conducting overflights and disguising its military planes as UN humanitarian aircraft. Iraq undid all of the good work Tony Blair had done in foreign relations before 2001, notably in Kosovo. Cynics will say his embryonic plans for Darfur are nothing more than an attempt to change people’s perception of him, but they should be ignored. The West should have gone in much earlier, but hopefully the ‘classified report’ will prove not to be another dodgy dossier. If it’s correct, a no-fly zone should be a minimum requirement for the UN, and if they won’t agree to it, then Britain alone. This isn’t Iraq all over again. Why would we want 'personalised' public services? Do any of these sound like good ideas to you? It’s all part of the government’s obsession with putting technology to good use. They’re obviously assuming that naming-and-shaming doctors and teachers will make them care how they’re doing. In fact, if one of them is rubbish, an online rating by miserable ‘customers’ is unlikely to change their ways. What people really want is a GP who they can see at short notice, and who remains their doctor for years. Student reports and marks online? What a stupid idea. Few schools have anyone capable of building a simple one-page website, let alone a database that isn’t susceptible to hacking. Only those with an internet connection – not to mention the interest in it – would bother. And imagine the work required for teachers to input every mark. But surely making companies compete to clean streets is a good idea? Er… no. People want clean streets, and yes, they want value for money. But the government is breeding a thousand companies who devote 90% of their time to watching their back, rather than nurturing a company who can provide something valuable and build on years of experience. People want a good, local school and hospital. For a large proportion of the country living outside of the cities, there is no such thing as choice. And if they really wanted us to have choice, they wouldn’t have shut a load of hospitals. But the government are still after their ‘urban’ dream where millions can choose between good and bad schools, clean and ‘dirty’ hospitals and where, inevitably, the rich, educated elite make better choices than those without an internet connection and broadsheet newspaper. Stop trying to get ‘personal’. Get real. I’ve said it before and I’ll say it again. The longer Tony Blair stays in power, the worse things will get for the Labour Party. But it’s becoming more and more important that he goes sooner rather than later. Poll results predicting a Conservative lead of 11-13% perpetrate the view that a Conservative government in 2009 is almost inevitable. That’s a perception that Gordon Brown needs to change. Back in 1995/6, it was obvious the Conservatives were on their last legs. There was little they could do to change the perceived wisdom that the Tories were sleazy, old and without fresh ideas. Well skip forward to 2007, and it’s becoming hard to disassociate Labour from the same problems. The Cash for Honours inquiry is an unfortunate mirror of the Cash for Questions row – albeit with the threat of jail sentences for added flavour – and there’s only so many tweaks the government can make to the NHS and the education system before running out of ideas. We’re about halfway through a Labour government. The bristles on a new broom are being weakened every day Mr Blair stays in charge. America looks set to go it alone in its widely-anticipated “troop surge” in Iraq. 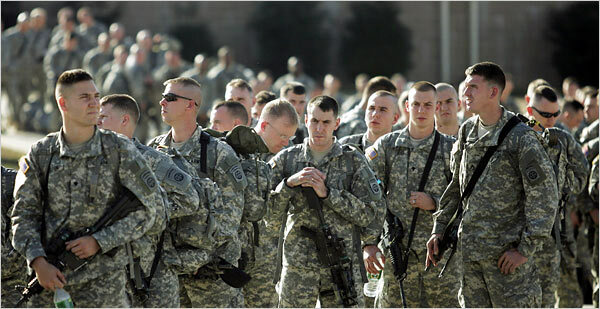 An extra 20,000 U.S. soldiers will be sent to the country to ‘finish the job’ and build a longer-lasting peace. But Britain and other (notably miniscule) members of the coalition don’t intend to follow suit. It’s widely agreed that British forces have been having more success than the Americans, using a cautious, softer approach in trying to win over ‘hearts and minds’. President Bush’s advisors seem to believe they can achieve the same ends through very different means. Perhaps this is the only option open to the United States. Its forces are hardly renowned for their peacekeeping skills, so a surgical strike may be their own possible plan. But there’s been criticism of the plan in Congress. The Democrat-led Senate is considering blocking funding for the surge, and a number of Republicans have spoken out against it too. And with Britain looking to reduce its commitment during 2007, it appears few people have faith in the ‘surge’ as an effective method of bringing peace to Iraq.